MSHA Part 46 Annual Refresher Classes offered by CRS. This is a MSHA Part 46 required annual refresher training course required for any drivers that enter into a surface mine, gravel pit. Including the following drivers; fuel delivery, dump truck drivers, tire repair, equipment repair, miner, etc. 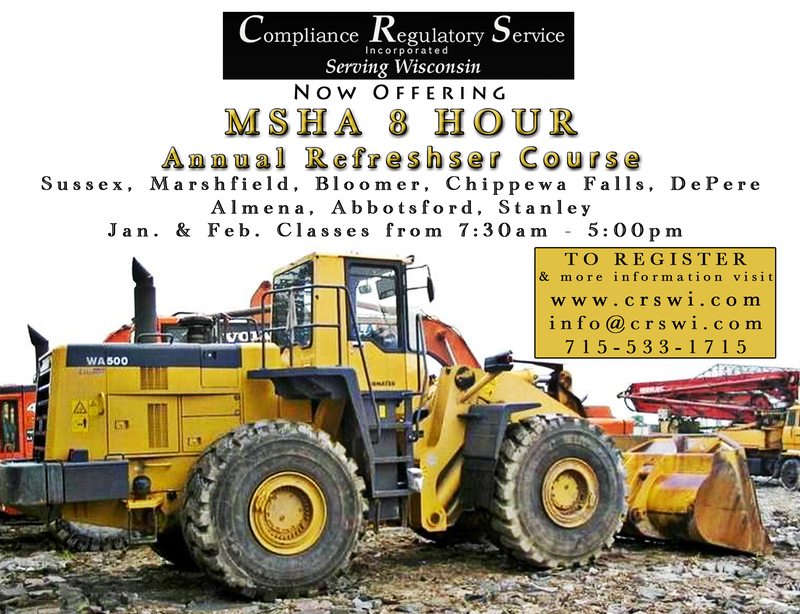 See list of Wisconsin locations below where we will be offering these MSHA Annual Refresher Classes. Contact us regarding costs and availability if you would like to host a MSHA Group training Class onsite at your local business. Please contact the office to reserve your seats for your desired class. Spots can fill up fast and we reserve seats as those requests come in to the office. Please call our office to have your name added to the list of people who still need training. **If you sign-up for a class and do not show up there will be a $10 charge to help cover the cost of the food ordered for your lunch. This also applies to individuals who need to change their class date. ** Please call the office if you have questions. If you have a group of 20+ people, please contact us to schedule a MSHA class or put your name on the waiting list. Cost for training from $55.00 per person which includes lunch. Please contact us direct for onsite business training costs and details. Please RSVP with the number of people that will be attending no later than 10 days before the MSHA training class you signed up for. Please let your fellow truck drivers know to attend this 8 Hour Annual MSHA Refresher Training Required for any drivers that enter into a surface mine, (gravel-pit). This also includes the following drivers: fuel delivery, dump truck, tire repair, equipment repair, miner, etc. Inquire about our Onsite Company MSHA Classes also offered where we can bring the training to you and your staff.